We love a unique and personalised gift in our household, it could be for a birthday, anniversary or to celebrate a special occasion. One of the recent milestones in our lives as a family of three (now a family of four) is moving into our house from our flat a couple of months ago. This was a huge achievement and something we never dreamed would happen in London. 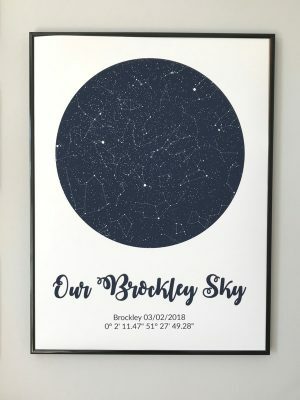 A brilliant way to capture this day and to add a personalised print to our home is of a unique star map by Modern Map Art. These star maps are something special and I find them really interesting to look at. What’s amazing about them is that no two star maps are the same. So our star map shows exactly what the night sky looked like on that very date and in that very location. Pretty cool, hey? As already mentioned they make an ideal gift for a special birthday, anniversary or engagement, or to commemorate the birth of a child. 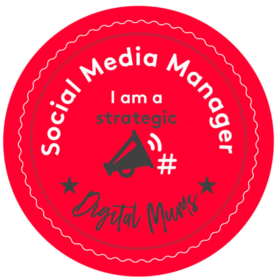 It really is a brilliant way to capture an important event or milestone. The process of ordering the star maps online is really quick and easy. Simply head on over to Modern Map Art and start customising. 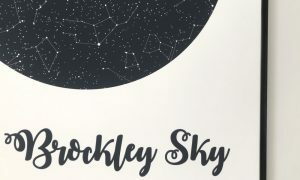 You can choose between a poster, framed poster or canvas starting from 8 x 10 inches, and the details that you need to provide include your chosen colour scheme, location, date and font. We opted for a star map in navy on a white background with the October Twilight font. What I loved about the ordering process was just how quickly I received the star map, and also how soon I received the PDF proof to review and approve before it went to print. 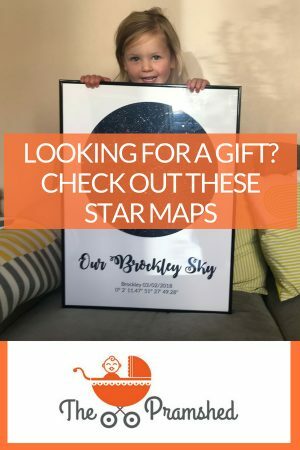 I’m sure that any star gazer would love to receive one of these maps and hopefully while away a few hours trying to spot the different constellations. Can anyone spot the saucepan or the big dipper? 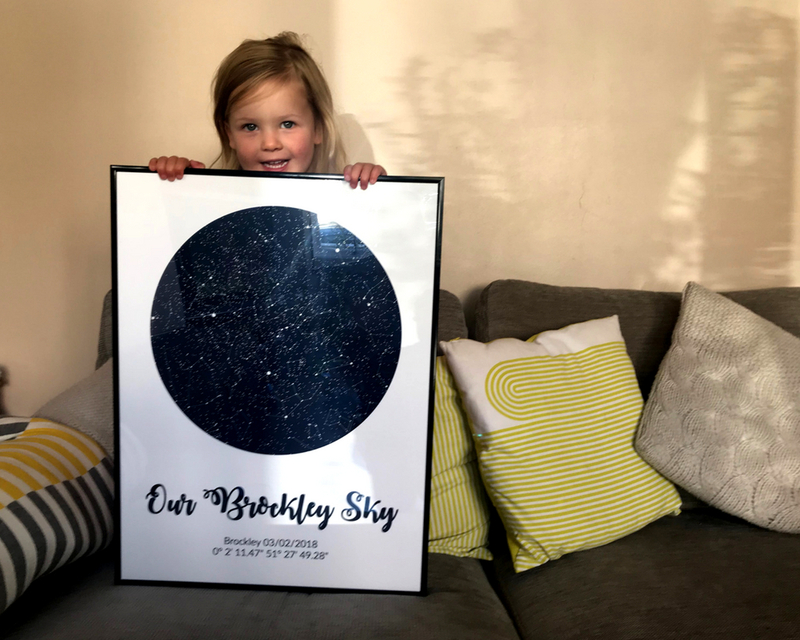 So if you have a star lover in your family, or someone who loves to look at the night sky, a star map makes an ideal present. Or if you have a special date you would love to remember and a blank wall in your home that is crying out for a picture, go get a star map. Now I just need to find a spot in our home where the map can live, where hopefully it will receive lots of lovely comments from family and friends. As you can see our toddler loves the map and was very happy to show it off to the camera. This is a collaborative post with Map My Art. 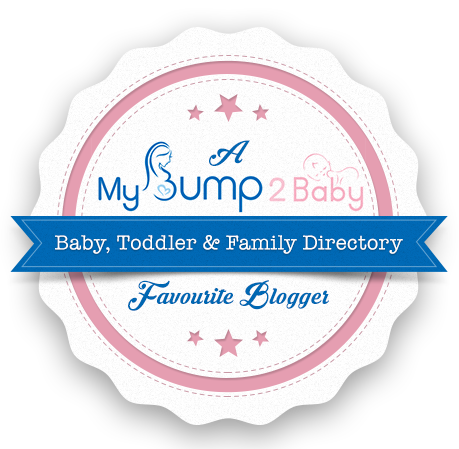 We received the star map in exchange for a review and all opinions are my own. This is fab! What a great gift it would make for someone who is hard to buy for. 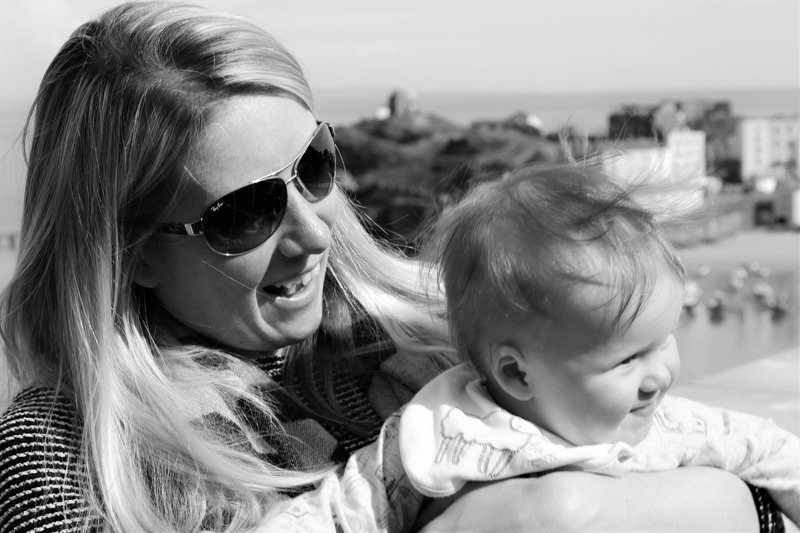 Kim Carberry recently posted…The first of the lasts: Sports Day.